We’d love your help. Let us know what’s wrong with this preview of Murders and Metaphors by Amanda Flower. January means ice wine season in the Niagara Falls USA Today bestselling author Amanda Flower is back with the third in her more-charming-than-ever Magical Bookshop mystery. Fans of Sofie Kelly and Heather Blake, prepare your bookshelves! To ask other readers questions about Murders and Metaphors, please sign up. Just got part 3 in the series on my phone. Never read the first 2. Is that neccessary or can I start with 3 without missing any information? Cindi Read on, though you'll likely want to read the first two after you finish this one...it's that good! Amanda Flower is one of my favorite authors. Murders and Metaphors is the third book in the Magical Bookshop Mystery series. I love this series! The thought of a magical bookstore with an enchanted tree growing in the middle makes me happy in itself. Add in that customers visiting Charming Books get magically matched with the perfect books.....and I'm just totally sucked in by this series. I wish Charming Books were real! I would be there all the time! :) I wonder what my perfect book would be?? Violet Waverly runs Charming Books with her g Murders and Metaphors is the third book in the Magical Bookshop Mystery series. I love this series! The thought of a magical bookstore with an enchanted tree growing in the middle makes me happy in itself. Add in that customers visiting Charming Books get magically matched with the perfect books.....and I'm just totally sucked in by this series. I wish Charming Books were real! I would be there all the time! :) I wonder what my perfect book would be?? But, of course, that doesn't happen. An author is stabbed to death with a grape cutting knife at the annual Morton Vineyard ice wine harvest. Violet, Daisy and the Red Inkers writing group are back on the case! Who put the wine expert on ice? Violet is determined to catch the killer! This story is a great addition to this delightful cozy series! The mystery is interesting and engaging with plenty of twists and suspense. I like Violet as a main character. The side characters are all quirky and awesome. In this newest book, there are some nice developments in background story and character development. Can't wait to see how things develop in future books! The last few pages made me smile. Grandma Daisy is coming into her own! :) I was a bit surprised by the solution to the mystery, although it does make perfect sense. I just didn't see it coming. All in all, a very entertaining and fun read. I love Emerson and Faulkner. My favorite character though is Daisy....she's just lovely...and feisty when she needs to be! Amanda Flower never disappoints. I enjoy every book I read by her. I will definitely continue reading this series. Her Magic Garden series, Amish Candy Shop cozies and Appleseed Creek series are also favorites. Charming Books was to host the signing of Belinda Perkins’ new release out at the vineyard of Violet’s ex and his family. Charming Books’ owner and custodian, Violet Waverly was not impressed. But Grandma Daisy had organized it so Violet had no choice but to go along for the ride. Belinda was a nasty piece of work and when her body was discovered out among the snow-covered vines after the signing, and her death looked like the work of her sister, Violet’s best friend Lacey Dupont, Violet knew sh Charming Books was to host the signing of Belinda Perkins’ new release out at the vineyard of Violet’s ex and his family. Charming Books’ owner and custodian, Violet Waverly was not impressed. But Grandma Daisy had organized it so Violet had no choice but to go along for the ride. Belinda was a nasty piece of work and when her body was discovered out among the snow-covered vines after the signing, and her death looked like the work of her sister, Violet’s best friend Lacey Dupont, Violet knew she had to investigate to clear Lacey’s name. Cascade Springs in the Niagara Falls region was a quiet little town as a rule. But with the deepest of winter shrouding the houses and people, Violet had her work cut out – she had more suspects than she knew how to deal with. So she enlisted the help of the magical bookshop – the essence would direct her to the answers she sought. And when that direction was Little Women by Louisa May Alcott, Violet found herself even more confused. What was it telling her? Would she be able to solve this murder mystery before someone else died? Murders & Metaphors by Amanda Flower is the 3rd in A Magical Bookshop Mystery series, and the first I’ve read. Intriguing and different, I was enchanted by the magical bookstore, and loved Emerson the cat and Faulkner the crow – both permanent residents of Charming Books. And I just wanted to give Grandma Daisy a hug 😊 A great cosy read which I recommend. With thanks to NetGalley and Crooked Lane Books for my digital ARC to read in exchange for an honest review. What is there not to love about a cosy mystery in a perfectly picturesque little village near Niagara Falls? Especially when the main character is custodian of a magical bookshop with an enchanted tree, books that fly off the shelf to pick their readers, a talking crow and a sweet but very clever little cat. Although this is the third Magical Bookshop Mystery (and I have not yet read the first two) I had no trouble jumping straight in and getting to know the characters. Violet Waverley, the reluc What is there not to love about a cosy mystery in a perfectly picturesque little village near Niagara Falls? Especially when the main character is custodian of a magical bookshop with an enchanted tree, books that fly off the shelf to pick their readers, a talking crow and a sweet but very clever little cat. Although this is the third Magical Bookshop Mystery (and I have not yet read the first two) I had no trouble jumping straight in and getting to know the characters. Violet Waverley, the reluctant caretaker of 'Charming Books', has settled back in her home town of Cascade Springs after running from a bad relationship to college in Chicago. Returning to help out her grandmother, Daisy with running the shop, she was initially reluctant to take over as caretaker but has since discovered that she loves being back in her quaint little home town, where everyone knows each other and everything is within walking distance. When an author is murdered at a book signing and one of Violet's best friends is suspected of killing her, she is forced to find out who really killed her, especially when the bookshop keeps leaving her clues. Violet has to solve another murder before the police is arresting the wrong person. IIf you look for mystery and romance, this is it! Thank you Netgalley for this wonderful book. THIS BOOK ENDED PERFECTLY FOR ALL INVOLVED! I loved this book!!! I did get annoyed at the publisher for misusing your and you're twice!! But not a major deal and not the author's fault. This is my favorite series by Amanda Flower and it begs for one more at least! And potential love triangle ENDED. So much happiness. This is the third installment in the Magical Bookshop series but my first read in it. Violet and her grandmother Daisy live in Cascade Springs, New York--which provides the perfect setting for a mystery combined with a touch of paranormal. Belinda Perkins, who was born in Cascade Springs but has since found celebrity status as a wine reviewer, is murdered after a book signing at a local winery. Violet's best friend Lacey, and Belinda's sister, is the chief suspect but Violet is convinced that sh This is the third installment in the Magical Bookshop series but my first read in it. Violet and her grandmother Daisy live in Cascade Springs, New York--which provides the perfect setting for a mystery combined with a touch of paranormal. Belinda Perkins, who was born in Cascade Springs but has since found celebrity status as a wine reviewer, is murdered after a book signing at a local winery. Violet's best friend Lacey, and Belinda's sister, is the chief suspect but Violet is convinced that she is innocent and is determined to prove it. Her investigation turns up a number of suspects and motives but when she gets too close to the solution, she comes face-to-face with the killer. What an enjoyable read! It was easy to jump right into the story. I really liked the closeness between Violet and her grandmother; it brought up memories of my late Nana. The author does a wonderful job of developing the characters and bringing the reader right into the mystery. I live in the Niagara region and enjoyed the use of fiction and non-fiction. The development of Violet's romance with police chief Rainwater continues at a pleasant pace. I was amused with Belinda's nasty reviews of an ice wine, saying that one was attempting to have a tropical flavor comes off as a mediocre fruit punch and that customers would do better choosing ice wines across the border in Canada. Ice wine is really delicious and Canadian ones have had a reputation of being better than American but we are improving! If you want a less expensive American one, I suggest a Late Harvest Vignoles. Bring out a cordial glass for best enjoyment! A good ice wine should have notes of orange, honey, apricot and/or pineapple. 3.5 stars, another cute story by Flower. Makes me want to have my very own magical bookshop. As I have said numerous times, Amanda Flower is one of my favorite cozy mystery authors. No matter what book or series I pick up I know that it is going to be a terrific read and hit all the notes I look for when reading a cozy mystery. I was so happy to see that she was continuing the Magical Bookshop Mystery series. This series is set in the quaint town of Cascade Springs New York. The characters are well written, diverse, charming and some a bit quirky. I enjoy the relationship between Violet As I have said numerous times, Amanda Flower is one of my favorite cozy mystery authors. No matter what book or series I pick up I know that it is going to be a terrific read and hit all the notes I look for when reading a cozy mystery. I was so happy to see that she was continuing the Magical Bookshop Mystery series. This series is set in the quaint town of Cascade Springs New York. The characters are well written, diverse, charming and some a bit quirky. I enjoy the relationship between Violet and her Grandma Daisy. They are each still finding their way after Violet became the new Caretaker of the tree. The romance between Violet and Chief Rainwater is progressing nicely but there are going to be some bumps along the way. The characters are growing and coming into their own which is always one of the things I look for in a cozy series. The mystery was well done. It carries through the entire story and there are plenty of clues sprinkled throughout book. There were a couple of nice twists that I didn't see coming which added some drama to the mystery. I did not guess the identity of the killer and I think readers will be surprised. This series also has a nice hint of the paranormal that runs throughout each story. I don't think it is overpowering and I enjoy how the bookshop sends Violet hints on what she needs to solve a mystery. This book just hooked me from the start and I stayed up a couple nights past when I would normally go to bed so I could read farther into the story. A sure sign that a book has grabbed your attention. I hope there will be more books in this series because I am looking forward to seeing how things turn out for a few of the characters. When I requested this book I did not realize it was the 3rd book in a series that I had not read. While had no problem understanding the story it would have been better if I had read the previous books as the tale often refers to them. I now have 2 more books to add to my TBR PILE. Violet Waverley is now the caretaker of the Charming Books, a Magical Bookstore. There is a talking crow who had broken his wing as a fledging and refused to leave. Emerson, a tortie cat who went everywhere with his pr When I requested this book I did not realize it was the 3rd book in a series that I had not read. While had no problem understanding the story it would have been better if I had read the previous books as the tale often refers to them. I now have 2 more books to add to my TBR PILE. Violet Waverley is now the caretaker of the Charming Books, a Magical Bookstore. There is a talking crow who had broken his wing as a fledging and refused to leave. Emerson, a tortie cat who went everywhere with his previous owner. Both added humor to the story. The store keeps throwing copies of LITTLE WOMAN around. Violet does not understand what the store is trying to tell her. There are 4 Perkin sisters in the tale that are estranged from each other. Violet and Grandmother Daisy are supplying the books for a local winery for a book signing affair for sommelier Belinda Perkins. Violet had a lot negative history with the winery. Emerson managed to sneak into the car and ride to the event. After an upsetting scene between the two sisters, the affair closes. Violet left Grandmother Daisy to pack up as Violet is looking for Emerson who has managed to disappear. He leads Violet to a dead body. Will Violet find answers Belinda'death before a friend is arrested for her murder? This was a book that was a long time in the making, well it seemed like it was lol, and it definitely did not disappoint! I'm so happy this series found a new home and is able to continue. Violet's cat Emerson found the body of a famous sommelier and wine author in the Morton Vineyards where they were holding their annual ice wine grape cutting. Violet's friend Lacey who owned the local cafe with her French-Canadian husband was the woman's estranged sister, and since a huge blow-up between them This was a book that was a long time in the making, well it seemed like it was lol, and it definitely did not disappoint! I'm so happy this series found a new home and is able to continue. Violet's cat Emerson found the body of a famous sommelier and wine author in the Morton Vineyards where they were holding their annual ice wine grape cutting. Violet's friend Lacey who owned the local cafe with her French-Canadian husband was the woman's estranged sister, and since a huge blow-up between them had happened earlier, Lacey was the main suspect. David Rainwater, police chief and Violet's good friend knew he couldn't stop her from investigating, but he always told her to be careful. After an attempt on Violet's life, she was more determined than ever to find the killer. 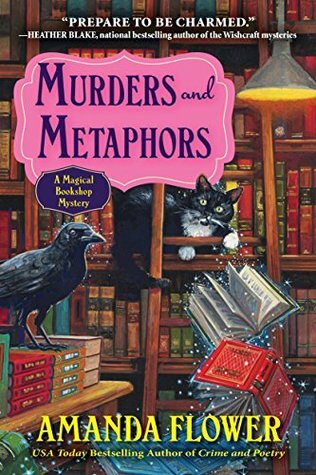 Murders and Metaphors by Amanda Flower is the 3rd book in A Magical Bookshop Mystery series, and a great addition. I love this book/series and highly recommend to all people who enjoy paranormal cozy mysteries. Violet Waverly and her Grandma Daisy run the Charming Books store, where the books have a mind of there own. When a nasty author is found dead after a book signing, and Violet's friend is the main suspect, the mystery begins. The best in this series yet. Magical bookstore proprietors Violet and grandma Daisy are tasked with supplying the books for a wine critic author at the vineyard owned by her old beaus family. Extensive history of love and hate hovers over the event, but is overshadowed by the murder of the authoress amongst the vines. When two sisters of the deceased head the suspect list, our gifted sleuths set out to prove them innocent. Assisted by the resident crow, cat and general essence of the shop, clue The best in this series yet. Magical bookstore proprietors Violet and grandma Daisy are tasked with supplying the books for a wine critic author at the vineyard owned by her old beaus family. Extensive history of love and hate hovers over the event, but is overshadowed by the murder of the authoress amongst the vines. When two sisters of the deceased head the suspect list, our gifted sleuths set out to prove them innocent. Assisted by the resident crow, cat and general essence of the shop, clues are placed about them via books, and animal mystique. Add in some romance and it’s a winner. 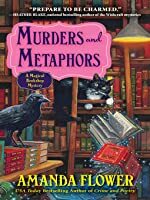 Murders and Metaphors is a cute cozy mystery with all the usual elements. I personally believe this type of book is excellent for relaxing. If you want literary fiction, you won't like this book. A 200 year-old Birch tree thrives in the middle of a Queen Anne Victorian that houses Charming Books, a magical bookshop in Cascade Springs, NY, where Violet Waverly serves as the tree’s Caretaker and bookshop’s co-owner. Along with her Grandma Daisy, Violet operates the bookshop that finds the perfect book for each customer along with helping the two women solve mysteries by providing clues found in books on the shelves. In other words, Violet and Daisy live and work in an enchanted environment A 200 year-old Birch tree thrives in the middle of a Queen Anne Victorian that houses Charming Books, a magical bookshop in Cascade Springs, NY, where Violet Waverly serves as the tree’s Caretaker and bookshop’s co-owner. Along with her Grandma Daisy, Violet operates the bookshop that finds the perfect book for each customer along with helping the two women solve mysteries by providing clues found in books on the shelves. In other words, Violet and Daisy live and work in an enchanted environment that provides a touch of the mystical in each well-crafted mystery. The mystery to be solved is the murder of author Belinda Perkins who happens to be the estranged sister of Lacey, who owns LaCrepe Jolie with her husband Adrien Dupont, and is good friends with Violet. Appropriate red herrings and interesting twists are carefully constructed by Amanda Flower along with engaging characters and relationships. Two special characters – Emerson, mischief making cat and Faulkner, poetry quoting crow – live with Violet and Daisy, adding humor and perspective to every story. In this third volume of the Magical Bookshop Mysteries, Violet, in addition to sleuthing, considers how the issue of being the Caretaker influences her ability to have a serious romantic relationship and share the knowledge of her responsibility with another. Ms. Flower writes bewitching mysteries that continue to captivate readers. I enjoyed this latest installment in this series! Great mystery that I did not figure out until the end. Murder And Metaphors is the third book in the Magical Bookshop Mysteries series. I was very excited to learn that this wonderful series has found a new publisher. I’ve really enjoyed the first two books in the series. Violet and Grandma Daisy are busy putting together a book signing for Belinda, an author, and a sommelier, to be held at Morton Vineyards. Violet would much rather have held the signing at their bookstore, Charming Books. The less interaction she has with Nathan Morton, the mayor of Murder And Metaphors is the third book in the Magical Bookshop Mysteries series. Violet and Grandma Daisy are busy putting together a book signing for Belinda, an author, and a sommelier, to be held at Morton Vineyards. Violet would much rather have held the signing at their bookstore, Charming Books. The less interaction she has with Nathan Morton, the mayor of Cascade Springs, New York, and Violet’s high school sweetheart. Belinda has been estranged from her three sisters since their mother passed and she blamed for not helping prevent her passing. One of the sisters is Lacy, Violet’s best friend since childhood. Lacy shows up at the signing with hopes of trying to settle their differences but instead turns into a heated argument that many of the attendees overheard. Later when everyone heads out to the vineyard to harvest the ice wine grapes that the Morton’s Vineyard hope will make a name for their vineyard. Soon Violet trips over the dead body of Belinda who had been with a grape cutting tool. A letter that was written by Lacy, that she tried to give to Belinda at the signing, is found by the lifeless body, and Lacy becomes the primary suspect. Violet doesn’t believe that Lacy is guilty of murdering her sister and sets out to clear her name. In addition, Violet wants to work on reconciling the sisters. Amanda Flower provides, once again, a well written and plotted story with plenty of red herrings. The story also includes a wonderful cast of believable characters. Murders and Metaphors by Amanda Flower is the best one yet in this series. I was immediately wrapped up in the latest visit to Cascade Springs. Ms. Flower's writing is so descriptive that the setting and the characters come to life. Violet and Grandma Daisy host a book signing for a popular author/sommelier, Belinda Perkins, at Morton's Winery. Violet is not looking forward to the event as that means she must once again be in contact with her ex-boyfriend, Nathan Morton. As usual the matriarch of Murders and Metaphors by Amanda Flower is the best one yet in this series. I was immediately wrapped up in the latest visit to Cascade Springs. Ms. Flower's writing is so descriptive that the setting and the characters come to life. Violet and Grandma Daisy host a book signing for a popular author/sommelier, Belinda Perkins, at Morton's Winery. Violet is not looking forward to the event as that means she must once again be in contact with her ex-boyfriend, Nathan Morton. As usual the matriarch of the Morton family is disagreeable but is resigned to Violet and Daisy's presence for the book signing. However, a murder disrupts the event and one of Violet's best friends is the number one suspect. Immediately Violet is on the case and with the help of the magical bookshop she might solve it before she's the next victim. I love the characters in this series. Each one, Violet, Daisy, Lacey, Sadie,and David Rainwater are becoming fully developed now and I love the way they are evolving in this book. I also enjoyed meeting a couple of new characters in this book. I look forward to learning more about them as the series progresses. I heartily approved of the bookshop's apparent approval of David Rainwater. I'm intrigued to see how that will play out in future books. The plot is intricate and filled with devious twists and several suspects that might want the victim dead. I loved every second of my visit to Cascade Springs and am already wishing the next one was available. This has been on of biggest surprises of this year [so far] for me; I never expected to love this series as much as I have - what a treat this has been!! I have loved all three of these books so much; they have been such a joy to read!! This one had so many twists and turns and I was as confused as Violet was throughout most of the book - I never saw the murderer coming and for me, that is the best thing about a well-written cozy. AND!!! the wretched love-triangle is O V E R!!! HA WOW! WOW! WOW! This one had so many twists and turns and I was as confused as Violet was throughout most of the book - I never saw the murderer coming and for me, that is the best thing about a well-written cozy. AND!!! the wretched love-triangle is O V E R!!! HALLELUJAH!!! Plus, you get Little Women as the book from the bookstore and some new, but awesome characters [well, minus the icky PI. He is just ick. ], and you have a fantastic book [hence the 5 stars]. You also learn that just because you are rich, you cannot buy friends, or people who like you or a good impression. The Morton's are a good example of what kind of person you should NEVER, EVER be, whether you have money or not. Mrs. Morton is a real piece of work and I just want to smack her whenever she is in the book. SO looking forward to more books in this series - it is absolutely my new favorite!!! When celebrity author Belinda Perkins was found murdered with a knife sticking down her back and the shop indicating the book The Little Women to Violet, she knew she had to get to the truth and save her friend Lacey from being charged for murder. My first book by Amanda Flower charmed me completely. I loved the cute little whodunit which kept me twisted with suspects and enamored with the characters. The story had references to the past but nothing which felt confusing. Amanda's writing kept me engrossed into the story and invested in Violet's life. I wouldn't have minded more of the mystery aspect, but that was just my mystery seeking mind nudging me with its niggle. Amanda Flower is a gifted author who never disappoints me. Murders and Metaphors is a well told tale, featuring the murder of a sommelier. When someone close to Violet is a prime suspect, she turns to her magical bookshop to find the answers. I love this series because the characters are so real, that I find myself with a group of friends whenever I open one of these books. This story has everything I look for in a cozy mystery, a well told story, unique characters and plenty of twists and turns to Amanda Flower is a gifted author who never disappoints me. This story has everything I look for in a cozy mystery, a well told story, unique characters and plenty of twists and turns to keep the reader engaged from beginning to end. Murders and Metaphors by Amanda Flower takes readers back to Cascade Springs, New York. Violet Waverly and her grandmother, Daisy own and run Charming Books with its magical birch tree. Violet is the newest Caretaker and she is still adjusting to her new duties. The booksellers are heading to Morton Wineries where Belinda Perkins, a sommelier and bestselling author, will be holding a book signing for her newest release. After the signing, the Morton’s will be hosting their annual ice wine cuttin Murders and Metaphors by Amanda Flower takes readers back to Cascade Springs, New York. Violet Waverly and her grandmother, Daisy own and run Charming Books with its magical birch tree. Violet is the newest Caretaker and she is still adjusting to her new duties. The booksellers are heading to Morton Wineries where Belinda Perkins, a sommelier and bestselling author, will be holding a book signing for her newest release. After the signing, the Morton’s will be hosting their annual ice wine cutting party. During the signing Lacey Perkins arrives to see her estranged sister, but Belinda ends up causing a scene by refusing to talk with Lacey. Emerson, Violet’s tuxedo cat, insisted on coming to the winery with them. When they prepare to leave, Emerson takes off into the vineyard. Violet gives chase and trips over a frozen Belinda Perkins with a curved grape cutting knife in her back. Thanks to the public altercation, Lacey ends up at the top of Chief Rainwater’s suspect list. Violet knows that Lacey would not harm anyone much less her sister, but Violet needs more information if she is to clear her friend. The shop keeps giving Violet copies of Little Women to guide her in the investigation. She now needs to figure out how the Perkins sisters relate to the March girls. Join Violet, Daisy, Emerson and Faulkner in their quest to identify Belinda’s killer in Murders and Metaphors. I always read a little bit about a book that I've read and am about to leave a review. In this case, I ran across someone saying that this series had a new publisher and there is where part of my complaints come in - at least that is what I'm thinking. I won the first book in a Goodread's Giveaway and ended up loving this cozy series even though it had a bit of supernatural powers. I couldn't wait to get this book #3 and it felt like I was going home again when I started the book, but then somet I always read a little bit about a book that I've read and am about to leave a review. In this case, I ran across someone saying that this series had a new publisher and there is where part of my complaints come in - at least that is what I'm thinking. I won the first book in a Goodread's Giveaway and ended up loving this cozy series even though it had a bit of supernatural powers. I couldn't wait to get this book #3 and it felt like I was going home again when I started the book, but then something happened and threw me off the track. First of all, I don't remember reading any errors in the other books but this one had them. Also it seemed to be a little bit over the top with the supernatural books flying around the bookshop and the crow was really annoying in this book. It was also repetitive in spots. The only thing that will keep me reading is that now Violet and the Chief seem to have come to an agreement. If it wasn't for that, I'd not pick up another one in this series. The author left me down! Thank you Netgalley and publisher for the chance to read this book! I did enjoy the story of the magical bookstore, and the legacy of guardianship entrusted to the caretakers. I liked the idea of the tree magic, and I really wish I could walk into a bookstore that knew which books I wanted. I would probably walk away with hundreds, but anyway. For a cozy mystery I felt this one was a little off, and I didn't really like the reasoning behind it. I did however see a lot of potential in the setting a Thank you Netgalley and publisher for the chance to read this book! For a cozy mystery I felt this one was a little off, and I didn't really like the reasoning behind it. I did however see a lot of potential in the setting and the characters and I'm happy to try some of the other books in the series. Do you love murder, mystery, surprises, books, and magic? Then you will love love love Amanda Flower's Murders and Metaphors. Amanda is one of my favorite authors. She is the cause of yet another sleepless night as I just had to read to the very end before I could close my eyes! So, warning, insomnia may accompany this book. Readers who love mysteries simply must check this one out! This is actually a three and a half star read for me. I'll go into more detail once I'm able to sort out my thoughts, but I will not lie and will admit that part of my rating is based on the numerous errors within the book. Missing words, wrong words used, continuity issues, they abound, and it is truly a sad thing to discover in a series that I've come to enjoy. More thoughts on this book to come later. Murders and Metaphors is a fun mystical story that takes place in upper New York state near Niagara Falls in Cascade Springs, home of the Charming Books bookstore, where the books choose the buyer. Housed in a lovely old Victorian home built around a tall birch tree, the bookstore has magical qualities where the books occasionally fly, is home to Faulkner, a talking crow and Emerson, a tuxedo cat with special powers. Violet Waverly is the caretaker of the bookstore that has passed down to the fe Murders and Metaphors is a fun mystical story that takes place in upper New York state near Niagara Falls in Cascade Springs, home of the Charming Books bookstore, where the books choose the buyer. Housed in a lovely old Victorian home built around a tall birch tree, the bookstore has magical qualities where the books occasionally fly, is home to Faulkner, a talking crow and Emerson, a tuxedo cat with special powers. Violet Waverly is the caretaker of the bookstore that has passed down to the female descendants one generation to the next for the last two hundred years. Violet's mother died when she was young so she has taken over for her grandmother, known to everyone as Grandma Daisy, although she is still active at the bookstore. The caretaker has to guard the secret of Charming Books and water the tree every forty eight hours with water from the local springs under the cover of night when no one can see. In this book, the third of the series, Violet and Grandma Daisy has been asked to set up a table selling books at a local winery owned by the Morton family. Mayor Nathan Morton, former boyfriend of Violet's, asked them to sell the books at the event but the Morton parents don't like Violet causing an awkward situation. They are selling books written by a local woman, Belinda Perkins, a sommelier and wine critic, who has made some enemies with her reviews. This is a late night event because there will be a midnight cutting of the grapes for ice wine. But before the night is over, Belinda is found in the vineyard by Violet with a vine cutting knife in her back. When Lacey, Belinda's estranged sister and Violet's friend, is considered a suspect, Violet sets out to prove that Lacey is innocent. Belinda was not a likable person so there are many people who are in the suspect pool. The "essence" of the bookstore is trying to direct Violet in her search by dropping Little Woman by Louisa May Alcott in front of her. Police Chief David Rainwater and Violet are very close and he is not happy with Violet getting involved in the investigation. But someone doesn't want Violet working the case so her life is in danger. I was not sure how I felt about a magical bookstore but it is a fun story with a mystery to solve that pulls one into the story and keeps the pages turning. Now, I have to go read the first two in the series. I am so thankful that the Magical Bookshop Mystery series has found a new publishing home since it is one of my favorite cozy mystery series by one of my favorite authors, Amanda Flower. I so enjoyed the first two books in the series, CRIME AND POETRY and PROSE AND CONS, and this third installment MURDERS AND METAPHORS did not disappoint. It is Ice Wine grape harvesting time at one of Cascade Springs, New York’s popular wineries, Morton Vineyards, and bookstore owner Violet Waverly is not exited I am so thankful that the Magical Bookshop Mystery series has found a new publishing home since it is one of my favorite cozy mystery series by one of my favorite authors, Amanda Flower. I so enjoyed the first two books in the series, CRIME AND POETRY and PROSE AND CONS, and this third installment MURDERS AND METAPHORS did not disappoint. It is Ice Wine grape harvesting time at one of Cascade Springs, New York’s popular wineries, Morton Vineyards, and bookstore owner Violet Waverly is not exited to spend time with her ex-boyfriend Nathan or his brother and parents. However, her Grandma Daisy has committed the pair to provide books for the harvest’s accompanying book signing by renowned sommelier Belinda Perkins. Things get hairy when Belinda’s estranged sister, and Violet’s best friend, Lacey tries to make amends, but Belinda makes a huge scene instead, and Violet soon finds Belinda murdered in the vineyards. Sure that Lacey did not kill her sister, Violet does some sleuthing of her own to clear Lacey’s name. The mystery is well executed and engaging. I was hooked from the very first page. There are enough clues and twists throughout the story and plenty of suspects with good motives to keep me guessing. I did not realize who the killer was until right before he/she was revealed, which is always a sign of a good mystery to me. There is a slight paranormal element, but even readers who are not drawn to paranormal cozies will enjoy the book. I enjoy Violet, Grandma Daisy, and Chief David Rainwater. I think I would readily be friends with all of them. All of the characters, both recurring and central to MURDERS AND METAPHORS, are nicely drawn and well rounded and developed. They are interesting and endearing, even those who are not very pleasant. MURDERS AND METAPHORS is a delightful cozy read. Highly recommended. I received an ARC of this title from the publisher through NetGalley and voluntarily shared my thoughts here.